Vodka and bitters, hello. Sounds like a good start to a week, right? I was recently commissioned by Absolut for their Absolut Crafted with Love campaign, in which I had the pleasure of highlighting a local quality maker in the beverage/cocktail industry. Personally, I’m particularly drawn to any cocktails that have a healthy amount of bitters, so getting to feature Hella Bitters in this campaign was the perfect pairing. Over the past few years, I’ve placed greater importance on the quality of everything I bring into my life, and ingredients are a big part of that. Most people probably don’t realize that Absolut sources all their ingredients within 75 miles of their distillery in Sweden. 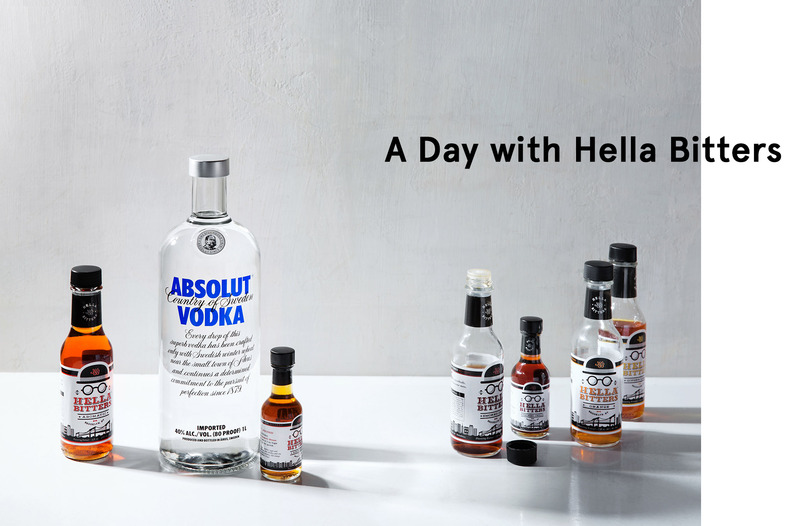 And of course, as a local small business, Hella Bitters cares a great deal about the quality of their craft and their end products, which are made in small batches with the finest ingredients available. During a visit to the Hella Bitters production facility in Long Island City, we learned all about the process of bitter making, and it’s surprisingly simple (in the sense that you can easily make your own bitters at home with a bit of patience!). We started by looking at some of the ingredients that go into their Aromatic Bitters, and then we made a small test batch featuring chilies, cassia, cloves, and a custom spice mix. The basic idea is to add any mixture of spices, orange peels – whatever you want really – to a high proof alcohol (the Hella Bitters guys use a 160 Proof Grain Neutral Spirit) and let it sit for ‘x’ amount of time (the time really varies depending on what you have in there too). Then, they manually tend to their production batches by shaking up the satchels of spices or stirring the mixture vigorously with a paddle. You can also test your small batch during the process by using a dropper to get a few drips into your palms, rubbing your hands, and taking a deep breath. Of course you can taste as you go too. When your bitters are ready, just strain the liquid into a bottle and now you have a little extra something to strengthen your favorite cocktail recipe. After we were all versed in bitters (at some base level at least), we made a few Moscow Mules featuring Absolut and Hella Bitters. 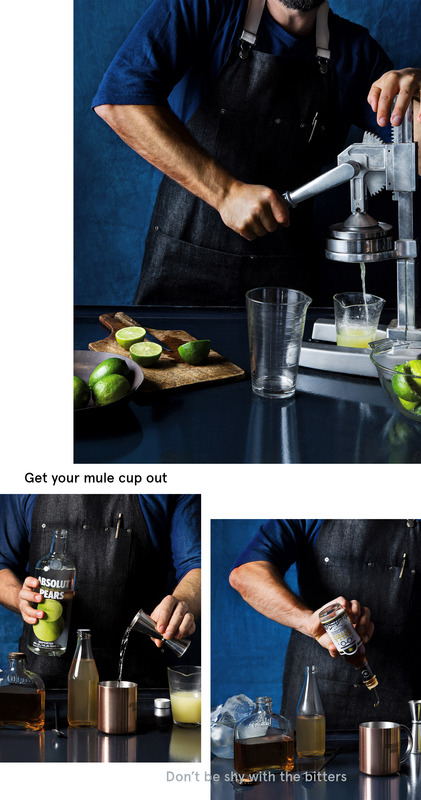 Shown here is a take on the Absolut Spicy Pear Mule, which contains 1 part Paddy Devil’s Apple, 1 part Absolut Pears, lime juice, ginger beer, and Hella Bitters Ginger Lemon bitters. As cheesy as it may sound, bitters really are like the spices of cooking in the cocktail world. A little goes a long way, and adding just a few dashes can completely transform the cocktail (but still in a nuanced way). 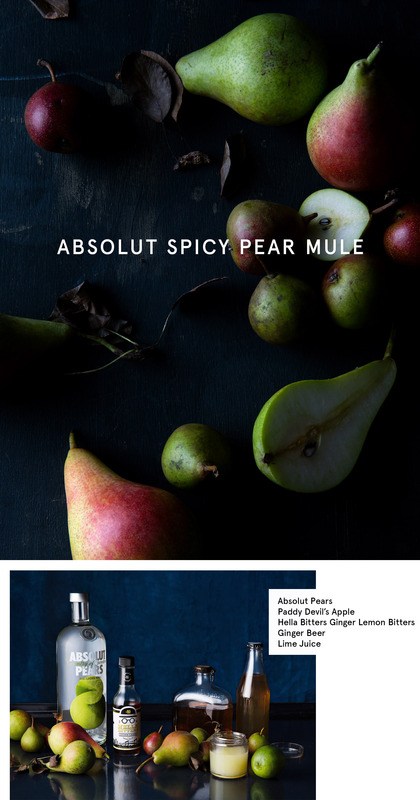 I admit I’ve always been a bit skeptical about flavored liquors but I was surprised to find that Absolut Pears is made from natural ingredients and doesn’t contain added sugar. So the pear flavor actually tastes like a fresh pear. This particular cocktail hits a lot of my preferred elements in cocktails – it’s got a good amount of booze, no added sugar, a ginger element, and bitters. 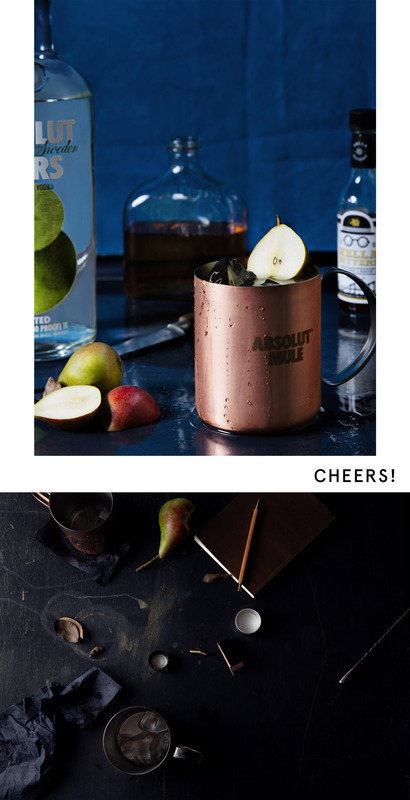 Disclosure: This post was created in partnership with Absolut. Thank you to Hella Bitters for being awesome on this shoot and Pamela Duncan Silver for styling! So cool! I had no idea that was what bitters was. Sounds like something fun to make! Wonderful! I love this content Alice!!! Alice, check out Bitter's Pub, and join the Bitters Club, on Washington Island, off the tip of the "thumb" of Wisconsin!